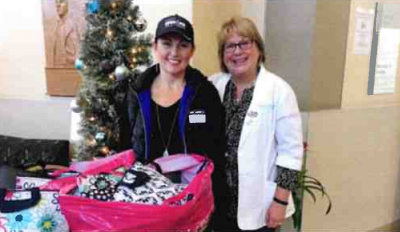 I would like to thank Laura Burnett and her family, friends, Thirty-One customers and coworkers at Goyette Mechanical Company for donating Thirty-One lunch bags for our patients in chemo. Additionally, Alisha Shann knitted a hat for each bag and Lorrie Murray donated puzzle books, adding a personalized touch to an already great gift. I appreciate everyone’s effort to make a positive difference for the patients we have the blessing and opportunity to serve. Last year our patients were so grateful for these bags. Being able to spread the cheer of the season once again is such a good feeling – and we couldn’t do it without our generous donors. According to Laura, one of the many benefits of being an independent Thirty-One Consultant is being able to provide these wonderful bags and she is already looking forward to next year!! Many thanks for the kindness and generosity of all involved! Your spirit of giving brings meaning to the holidays. Sincerely, Marsha Schmit, Breast Cancer Navigator. Goyette Mechanical is proud to announce the establishment of the Thomas and Genora Goyette Family Scholarship at Ferris State University for the HVACR program. Preference will be given to children of Goyette Mechanical employees and Genesee County students, as well as other requirements for GPA, ACT, SAT, etc. It is anticipated that the scholarship will be awarded to the first recipient in the 2020/2021 school year. Goyette Mechanical employs many FSU graduates and looks forward to employing future recipients of this prestigious scholarship. Go Bulldogs! 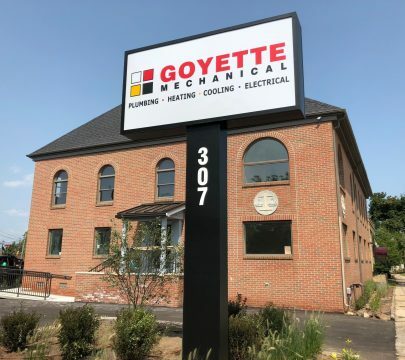 Goyette Mechanical is moving its Construction Division to 307 E. Court St. and will transition about two dozen employees to the new location. The company expects to complete the move by late September. Headquartered on Gorey Avenue off Center Road, Goyette has been in Flint for nearly a century. 6,024 homes have had their lines replaced so far in 2017, according to a press release issued by city officials. ABC12 caught up with workers with Goyette Mechanical to check in on the progress being made. “The project has gone well all year, summer went great, we’re getting into the colder times, things are going well, better than expected,” said Project Manager Joe Parks. Copyright 2015, Goyette Mechanical, Co. All rights reserved. Website Designed by Web Centre.